What synthetic material do we use in our products? We use Genuine BioThane® in all our products that we manufacture unless otherwise noted. What is BioThane®? What is BioThane®? BioThane® is the brand name of all coated webbing products made by BioThane® Coated Webbing Corp and its former subsidiary Bio Plastics Company. It’s basically a polyester webbing with a Thermoplastic Polyurethane (TPU) or Polyvinyl Chloride (PVC) coating that makes it more durable, waterproof and easy to clean. Is BioThane® better than leather? BioThane® is more durable, cleanable, stronger and easier to maintain. It is also readily available in different colors. Read more about BioThane® Straps vs Other Straps. Does the coating add strength? No. 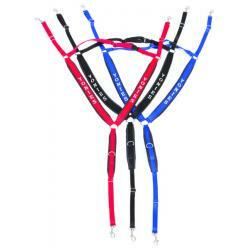 The tensile strength comes from the polyester webbing inside. How strong is the webbing? 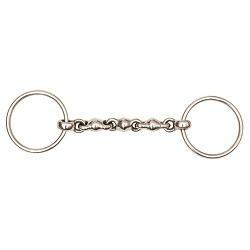 We have three different standard webbings that are commonly used. See BioThane® coated webbing. If there is a particular strength you need, go to GET IN TOUCH and or call us. Does synthetic hurt the animals? Synthetics do not hurt any more than leather. It all comes down to how the product is designed. A poorly designed item can hurt an animal and you would barely know it until they develop sores. Check for rub spots, if it's rubbing the horse you should ask someone if there is another solution, sometimes all it takes is some adjustment and you can avoid hurting your animal. No animal should need to suffer because of an ill-fitting harness! Ask your sales rep to help you if something doesn't look right. How do I clean the harness, bridles, halters etc.? Warm water and soap usually work well. You also can dab with a small amount of rubbing alcohol. What do you mean trim color? 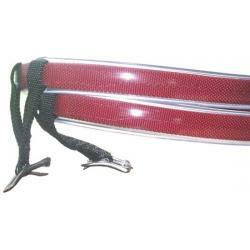 Trim Color is actually a strap that is in any color that you select. If you didn’t select a color the strap would be black as the standard color. Do you hold clinics or seminars? We can provide various HOW TO CLINICS if requested. Contact Yonie for more information by going to GET IN TOUCH. Please leave specific information on what, when, where and the type of clinic you would be interested in. Gift Certificates are available off-line. We do not currently offer electronic Gift Certificates. Please contact us and we'll get you whatever amount that you need. PayPal is used to securely send payments over the internet. You can choose to pay from your PayPal account balance, a credit card, debit card or bank account. To make a PayPal purchase, select PayPal during checkout and choose your method of payment. Your funds are transferred immediately and securely. Can I return my merchandise purchased with PayPal® from YONIES.com? YES! If you desire to return an item or items please utilize our Return Policy on the home page to ensure that all procedures are followed. Once your item is received and approved Yonies can credit your PayPal account. How do I contact PayPal® Customer Service? For the fastest response, you may access the user-friendly Help Center on PayPal.com. Developed by the PayPal Customer Service team, this Help Center contains a comprehensive information database. Simply type a question into the search box to receive a complete answer. If you do not find the information you need in the Help Center, PayPal Customer Service representatives are available to assist you. Send an email for a prompt response or contact PayPal directly by phone: Customer Service: 1-402-935-2050 (a U.S. telephone number) 4 a.m. – 10 p.m. PT, Monday through Friday, or 6 a.m. – 8 p.m. PT, Saturday and Sunday.